1. Battery pull tab allows battery activation without removing alarm from mounting bracket. 2. Large mounting base makes mounting easier, protects surface paint from dirt and covers imperfections. 3. Pre-stripped wiring harness with easy off cap does not require stripper tool. Tinned strands increase conductivity and wire nut grip. 1. One button design for easy operation and less confusion. Operate Hush® and alarm test. 2. Battery run down protection will shut down alarm memory when AC power is not present, reducing low battery chirp. 3. Dust cover protects senson from contaminants during construction reducing nuisance alarms. 1. Tamper resist locking feature deters battery and alarm theft. 2. Alarm memory flashers red LED indication which unit was the initiating alarm in interconnected systems. 3. Battery backup provides protection in case of power failure. 4. 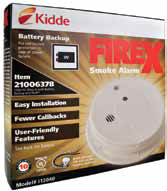 Interconnectable with up to 24 devices (of which 18 can be initiating) including smoke, CO and heat alarms. See user’s guide for complete instructions.